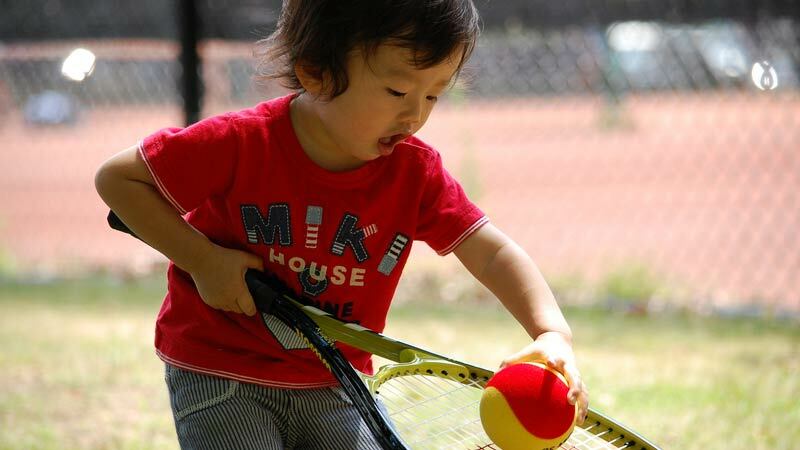 Home » Theory » What Age Should My Child Start Playing Tennis? You love tennis yourself. You also want your child to play and enjoy the game. So at what age should your child start playing tennis? The consensus answer from all the coaches I know and work with is 5-years-old. If your child is precocious, he or she can even start at age 4. As a coach myself, working with children age 5 is fine if they can focus and enjoy tennis. If your child starts earlier than 4, there is no benefit. The child is too young to understand what they are doing. Sure, you can bring them to the courts when they are 2 or 3-years-of-age and roll the balls to them and introduce them to the look of tennis. Maybe they’ll grow enamored with the balls, rackets and courts and this will make them more interested when they begin to actually learn one or two years later. If your child learns tennis after the age of 5, they can still become great players. 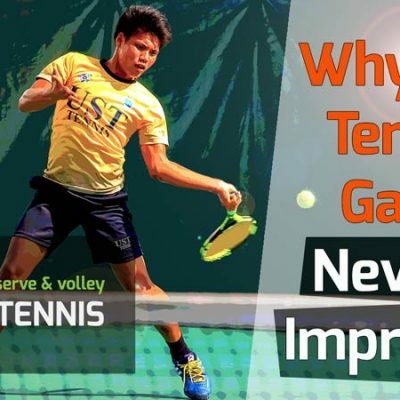 But in my opinion, and as a coach who has worked with many children, if a child starts learning tennis after age 10, he or she will be at a disadvantage compared to a child who learns earlier. Just like how we learn languages or reading and writing when we are young kids, the earlier we learn, the easier it is. Why Should My Child Learn Tennis Early? If your child learns proper stroke mechanics early on (before the age of 10), then it becomes completely natural for them to hit using textbook strokes. Starting your child out early will ingrain the correct stroke mechanics into their muscle memory. This will create a very good foundation for their tennis play over their lifetime. For certain, your child’s forehand, backhand, volleys and movement on the court will be very good with proper early instruction. The serve is a bit different though. 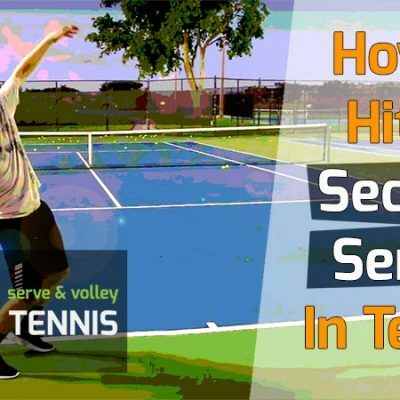 Due to the complex nature of the serve, it is often the most challenging shot in tennis for kids and people. I’ve seen children with great forehands and backhands struggle on their serve – even after 4-5 years of playing. The serve will usually not turn into a weapon for them until they grow taller and stronger, typically around age 12-13. So have patience with the serve while your child is still learning. If your child is older, like 12-13 years of age, and still wants to learn tennis, he or she can still do so and be a very good player in several years. But it will depend on their enthusiasm, athletic ability, and hand-eye coordination. 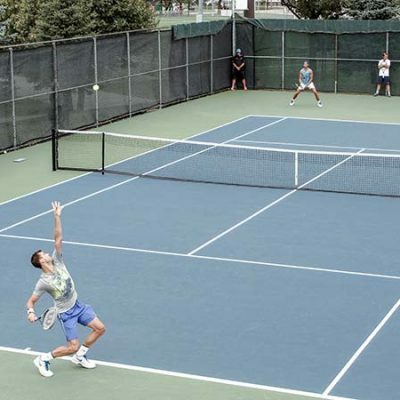 With the right coach and a lot of practice, a boy or girl 12-13 years of age can make their high school tennis team and even play college tennis. The important thing to remember is that your child is learning one of the best sports to play and will be able to enjoy tennis for a lifetime. How Should I Start Teaching My Child Tennis? 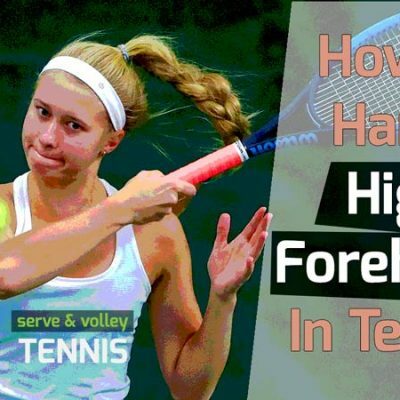 If you are a tennis coach yourself, then you can start teaching your child basic forehand and backhand technique right from the start. Chances are, though, you’re not a coach. In that case, you’ll want to hire an experienced professional tennis coach to train your child. It’s very important – and I must stress this – that you find an excellent instructor for your child from the beginning. It’s vital that the tennis pro you hire for a child has the right equipment to work with children. That means using red, orange or green kid’s tennis balls. A child age 4-10 should not be taught with regulation balls. Without going into a lot of detail, red balls are for the youngest learners, then comes orange balls and finally green. 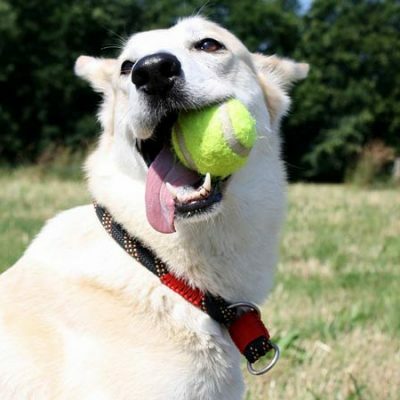 Green is the last ball a coach will use before moving up to regulation tennis balls, which happens at age 10 to 11. One more important point about hiring a tennis coach. If the instructor doesn’t show your child the correct way to play, your child will not learn the right technique and not enjoy tennis. Additionally, your child will have to undo bad habits later in life that will stunt their progress. You may have noticed 40 and 50-year-old club players with poor technique who never seem to improve. This is the result of teaching themselves to play tennis or learning from a bad instructor. 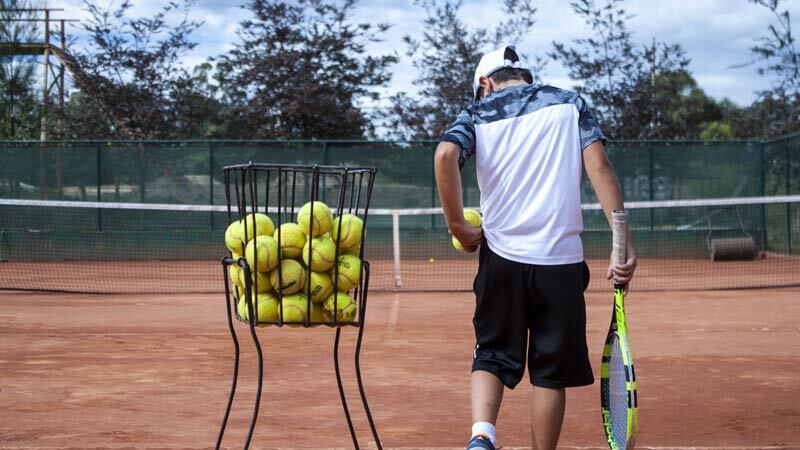 To discover how to find the right tennis coach for your child, you can check out our article on finding the right coach. As a quick piece of advice, you want to find a coach who is either USPTA certified or has worked with children for many years with a great track record of turning them into competitive junior players. If money is no object and your child loves tennis, the best place to learn is at a tennis academy. Most professional players on tour today (whether male or female) spent a good part of their formative years learning at tennis academies. They are expensive but they will offer your child top-rated, experienced coaching with lots of teaching tools and training aids. 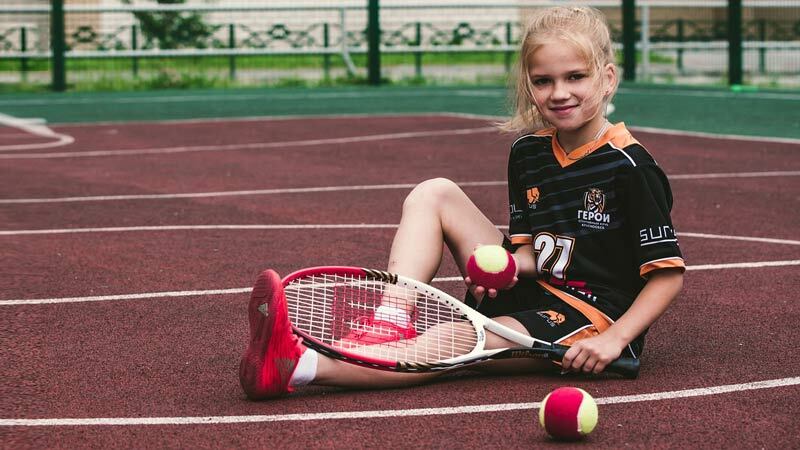 Your child will be immersed in a tennis environment with other children their age and level, which also makes the game social, competitive and fun. The bottom line is, get your child the best instruction you can afford right from the start. Tennis is one of those sports that costs money to learn and play. Your child also needs a good racket, proper tennis gear and plenty of court time to practice, which may cost money as well. 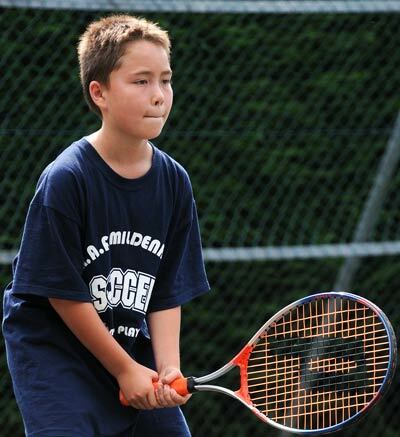 As your child progresses in tennis, have them play against other children their level. If your child loves tennis and is progressing well under an experienced coach, you can consider entering them into tournaments. Keep in mind the most important thing is for your child to have fun, get exercise and have a sport he or she loves to play their whole life. Forget about your child becoming a professional tennis player. Remember, only the top 100-125 players in the world can make a living playing tennis. In March of 2008, the USTA rolled out a new program for kids 10 and under called Quickstart. For the past 100 years, kids had to learn on regulation-sized tennis courts with regulation balls. It’s unfair and unrealistic to ask an 8-year-old to cover the same amount of court Roger Federer does. Additionally, regulation tennis balls are too hard and bounce too high for younger players. 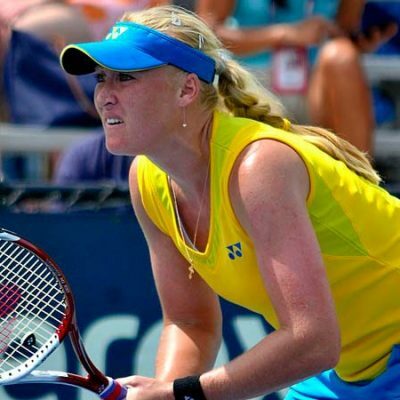 Younger players had difficulty learning and would often drop out of tennis as a result. Thus Quickstart was introduced to mitigate all of those issues. 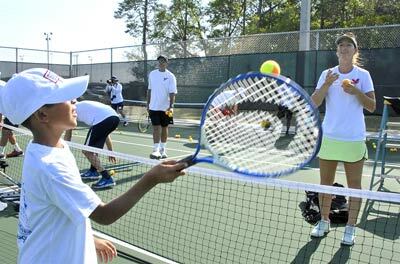 It’s a program designed specifically for children ages 4-10 that involves smaller sized courts, shorter nets, kid-sized rackets and softer, less bouncy balls. This allows kids to play on courts and with gear that is tailored to their size and strength, making the game a lot more playable and fun. Quickstart is a structured, supervised and spontaneous tennis program, designed to introduce kids to tennis in a no-pressure, fun environment. Lots of fun, silly games are part of the curriculum to keep kids engaged and learning. It works and kids usually have a lot more fun in this type of environment than learning by themselves on a regulation court. I recommend the Quickstart program if your child is age 4-10. If you want to enroll your child in Quickstart, there is probably a program in your city or closest populated region. I suggest doing a google search for your local tennis centers and academies. You can then call around to see if they have Quickstart. The following is my personal opinion, as a coach, on how I would teach my own child. First, I would want to know if my child has an interest in tennis. Ideally, I would pay for a few Quickstart lessons. Afterward, I would ask my child if they enjoyed them. If yes, I would have them stay in Quickstart for a while, especially if they are young. While Quickstart is great for introducing children to tennis, I might want to hire a certified USPTA coach at some point (maybe after a year or two of Quickstart, when my child is around 7-8 years of age) to give my child one-on-one training. This could be in conjunction with Quickstart too. Private lessons once or twice a week would be ideal. As my child gets closer to 9 and 10 years of age, I would drop Quickstart and stay exclusively with one-on-one coaching while also enrolling my child in tournaments to play kids their own age and level. Furthermore, as a tennis player myself, I would take my child to the court and hit with them when time allows. I could even fill a hopper full of balls and have my child practice volleys, forehands, backhands, and return of serve. At this point in your child’s development (after several years of consistent play), their technique should be solid, so you wouldn’t be coaching them – simply feeding them balls to practice with. As my child progresses into their tween years, I would stick with one-on-one coaching and tournament play. If I could find other children at my child’s level, they could play fun matches on the side. At this age (11-13) your child should play a lot of matches to gain experience playing many different players and styles. From age 14 on, I would continue doing the same: one-on-one coaching, tournament play and fun matches. At age 14-15, my child would probably be good enough to make his high school team and then ultimately play college tennis. In the most fortunate scenario, they would get a full scholarship and be the best player on their college team. This is the reward of proper coaching and going down the right tennis track. This is how I would envision my child progressing from first hit to competitive play as an adult. Of course, this scenario assumes my child continues to love tennis while I have the money to fund his learning. I consider the path I laid out the ideal scenario for my child’s playing career into adulthood. My final thought is to make fun the first priority for your child when learning tennis. If tennis isn’t fun, your child will not want to play, no matter how much you yourself love it. Don’t have any expectations at first. Your child will offer you feedback, and you can then determine how serious they are about tennis. Once you know, you can either keep it casual and fund or ramp up the learning time. Remember, your child’s development is all in your hands. Make the best decision you can for their sake. If you have any questions about teaching your child tennis, please leave us a comment and we’ll be sure to reply!